You’ll notice the ViPR has been getting ever more popular in our gyms and group fitness classes recently and this is because it can add another dimension, with load to your functional movement exercises on the gym floor. 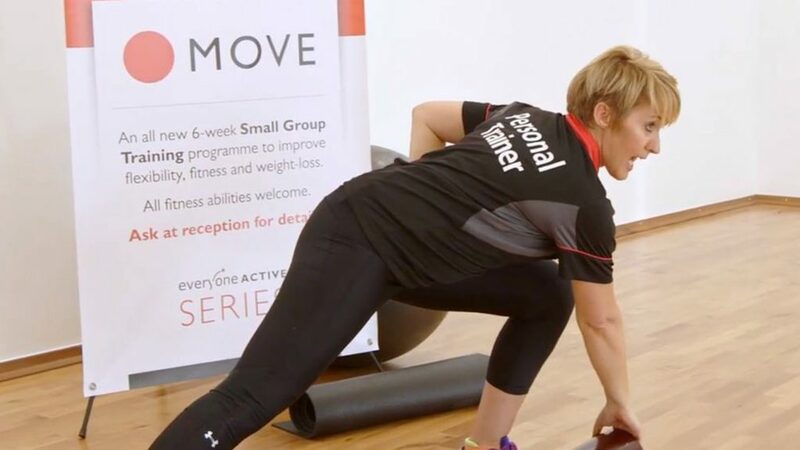 Here, our Master Trainer Sue will take you through six different ways to make the most of these fantastic bits of kit. In this exercise, you need to position yourself in the squat position, with your legs slightly wider than hip width apart, heels in, toes out and holding the ViPRpr horizontally in front of you by the handles. Then hold it vertically in front of you, squat down and bring the ViPR between your legs. You then need to stand, bringing the ViPR up high above your head, rotate it through 180 degrees and bring it down between your legs once again. Repeat a number of times. As with any squat exercise, this is great for your glutes, your hamstrings, your calf muscles and your quadriceps, as well as being great for core strength and stability, while they’re also good for fat burning and weight loss as well. By adding in the ViPR element, however, you’re adding in functional arm movement as well as boosting the work your core is doing, which will help build muscle and mobility throughout your upper body, even more than a standard squat would usually. Begin by standing the ViPR vertically on the floor in front of you and grab it by the top, standing with your feet together. Then, take a step to the side with one foot, go into a lunge and touch the ViPR to the ground and return to the standing position, bringing the ViPR with you. Once you’ve returned to the standing position, swap hands and go the other way and repeat this movement a few times. This is a fantastic exercise to work your hips and to build the muscle mass and flexibility too, while it’s also brilliant for building your obliques and your abs as well. For this exercise, you need to start off in a plank position – either a full plank or one on your knees – with your chest directly above the ViPR, which needs to be slightly offset to one side. You then take the hand on the opposite side to which the ViPR is offset, reach behind your supporting arm and pull it through beneath you to the other side, although it’s important not to drag it too far. You then return your arm to the starting position and swap hands before dragging the ViPR through the opposite way. As a plank exercise, this is great for all the usual suspects such as strengthening your core, helping your posture and reducing back pain, but with the added arm movement with the ViPR, it’s also great for working your lats, as well as your triceps. Lie on your back, with your legs bent and your feet on the floor, holding the ViPR horizontally across your chest. You then need to lift your feet up above your knees and extend your arms, pushing the ViPR away from you. Then, extend one leg away from you so that your heel touches the floor, and then bring it back to the original position and then extend the other leg. Keep alternating legs, ensuring that you do an equal number of repetitions for each leg. If you’d like to make it a little bit harder, you can begin with your legs pointing straight up in the air, rather than slightly bent. In this exercise, the ViPR is mostly acting as a counterbalance and with each leg extension, you’re working your core, building up its strength and stability. Begin with the ViPR held horizontally in front of your midriff, take a step forward with one leg and as you do this, push the ViPR forwards with the opposite arm to that which you stepped forward with. You then need to return to the starting position and repeat on the opposite side. This is a fantastic whole body exercise, working your legs, your trunk and your upper body all equally. Make sure you do the exercise quickly, but still in a controlled fashion in order to get the most from it. Start with the ViPR laid horizontally on the floor in front of you, squat down and pick it up at the very ends. Stand up, with your feet about hip width apart and hold the ViPR across your midriff. Keeping your arms straight, raise the ViPR above your head, hold for a second or two and then bring it back down in front of you in a controlled fashion, making sure gravity doesn’t take over. When doing this exercise, it’s important to ensure you’ve engaged your abs and you drop your shoulders. This exercise really concentrates on the shoulders, working the deltoid muscles in particular, although it’ll still help you build up core strength and stability as well. So, next time you’re in the gym and you’re looking for something new to augment your current work out regime, why not give these exercises – and the ViPR – a go?